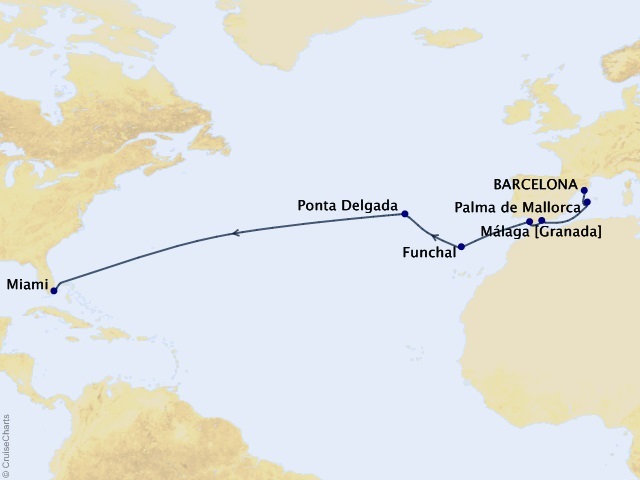 Departing from Barcelona on November 22, 2019, prices starting at $649. 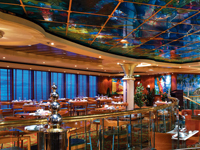 Norwegian Star embodies the relaxed Freestyle Cruising concept with laid back voyages to the the Caribbean, Europe, and across the Atlantic. 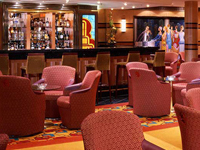 Featuring 15 delicious dining options, 11 bars and lounges, a sprawling spa, an always-exciting casino, plus tons of fun for kids of every age, the Norwegian Star has something for everyone. 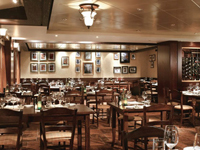 Whether you're exploring Europe's incredible history or sipping Piña Coladas in the idyllic Caribbean or spending leisurely days at sea on a transatlantic journey, the Norwegian Star is truly a ship that offers it all. Whether you're hankering for a burger or the food court-style eatery, you can enjoy it all, 24 hours a day, in the family-friendly atmosphere of the Blue Lagoon. 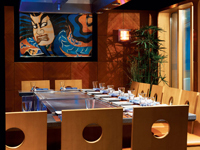 This elegant adventure into Pan Asian cuisine is a world-class experience in the finest Japanese, Thai, and Chinese cuisine. Traditional, tasty, and molto Italiano. 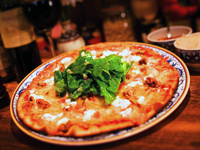 Enjoy pasta, pizza, and authentic Italian desserts in this casual eatery reflecting a village Trattoria or traditional farmhouse kitchen. Looking for a romantic little table for two? Right this way. 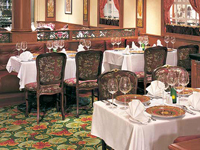 The light, airy atmosphere and menu of classic and modern gourmet cuisine is just like a French café. 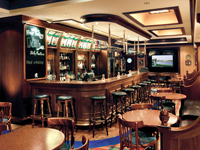 This indoor buffet offers an extraordinary selection of family-friendly international fare, plus an additional dining area that's just right for the pint-sized crowd. 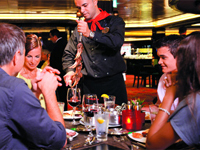 The very first pizza delivery service at sea is offered 24 hours a day aboard Norwegian Dawn. The pizza team is happy to deliver a piping hot pie, homemade with your favorite toppings, directly to your table, stateroom, or your favorite bar or lounge. 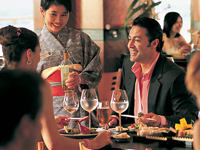 Just ask your server or call room service to place your order. Each delicious course is expertly prepared and presented by the award-winning chefs, members of the world famous gourmet society Chaine des Rotisseurs. Enjoy the Bavarian ambiance at the Bier Garten on the terrace where you can order cocktails, refreshing drinks and, of course, beer. 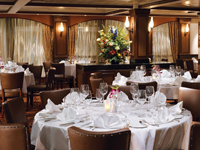 Enjoy a premium selection of champagne and vodka, caviar, paté, and foie gras. 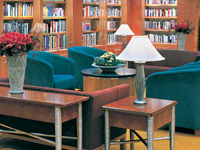 The cool sophistication and charm of this establishment makes it an ideal venue for an intimate cocktail party or an evening of fun. Going down to the pub takes on new meaning at the Red Lion, a traditional English pub featuring pool, large screen TVs, fish 'n chips, and proper beer on tap. 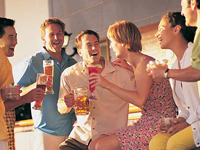 Topsiders Bar & Grill is located near the Oasis Pool, The Grill, and two hot tubs. All you need to do is pull up a deck chair and relax. 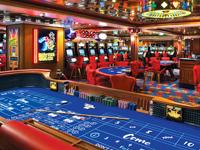 Award-winning and always exciting, the casino onboard has the action you are looking for with your favorite slots and table games, including live poker. 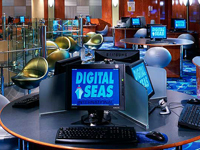 And if you're new to gaming the friendly Casino Manager can introduce you to personalized instruction with one of the seasoned, professional staff. 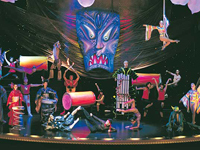 It's showtime, and there's a really big show waiting for you at the Stardust Theater. Enjoy Broadway and Vegas-style productions in a traditional European opera-inspired auditorium reaching three decks high. 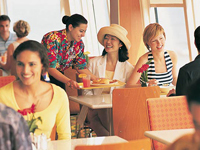 There are numerous ways to stay in shape while on board. 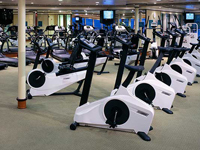 The Barong Fitness Center is open from 6am to 11pm, with a full service gym and aerobics/fitness classes offered daily. 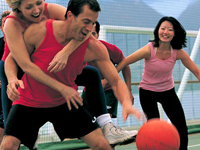 Shoot hoops, join a pickup game, or play beach volleyball at the net enclosed, outdoor Basketball/Volleyball Court. 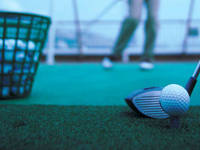 Take your clubs out for a drive at one of the two Golf Driving Nets onboard, because there's no such thing as a lost ball or a bad drive on Norwegian Star. Just because you're at sea doesn't mean you can't get in your daily swim. The indoor lap pool includes a Thermal Suite. Jump on in; the water feels fine. If being pampered is your idea of a vacation, the Mandara Spa is for you. It's a full service beauty salon and spa offering a wide range of treatments to rejuvenate you. 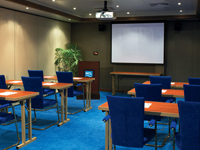 Norwegian Star's meeting room area offers four rooms that can be used individually or combined into one large conference space. 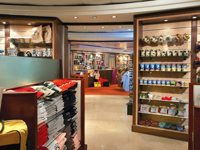 Whether you need a new bathing suit or a surprise gift for your sweetheart, the Galleria Shops is a department store that offers a wide selection of brand name and specialty goods. 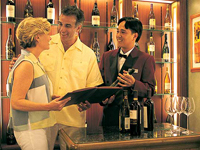 Visit the shipboard wine cellar for an opportunity to sample and purchase fine wines from around the globe. Totally zoned for kids, there are places to do arts and crafts, watch movies, and play on the computer. 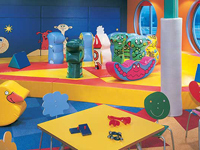 There's even a mini indoor jungle gym and a quiet space for toddlers. 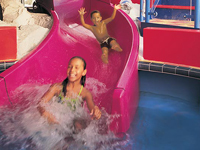 The Splash Down Kids' Pool is just right for pint-size splashing, playing and paddling with space age rocket slides, a paddling pool, and a kids' hot tub. A hip place for teens to hang out. 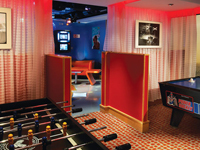 It features a video wall, jukebox, foosball table, and air hockey. By night it becomes a teen disco. With room for up to three guests,Norwegian Starstaterooms have two lower beds that convert into a queen-size bed and a pull out sofa to accommodate one more. Along with a sitting area, floor-to-ceiling glass doors and a private balcony with an amazing view. With room for up to four guests,Norwegian StarOceanview Staterooms come with two lower beds that convert into a queen-size bed and additional bedding to accommodate up to two more guests, as well as a porthole that offers a great view. 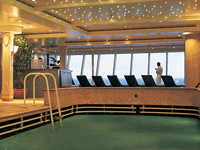 These are mid-ship staterooms, which means you'll be right near everything fun and exciting on board. With room for up to four guests, theseNorwegian StarOceanview Staterooms come with two lower beds that convert into a queen-size bed and additional bedding to accommodate up to two more guests, as well as a picture window with a great view. 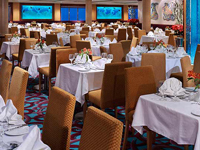 These are mid-ship staterooms, which means you'll be right near everything on board. Norwegian StarMini-Suites sleep up to four guests, with two lower beds that convert into a queen-size bed as well as a sitting area, private balcony, luxury bath with shower and additional bedding to sleep two additional guests. Because these are mid-ship Mini-Suites, you'll have easy access to everything fun and exciting on board. Norwegian Starmid-ship staterooms can accommodate up to three guests, with two lower beds that convert into a queen-size bed and a convertible sofa to sleep one more. Also includes a sitting area and floor-to-ceiling glass doors that open to a private balcony. 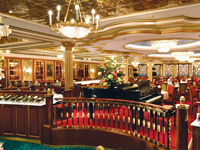 Because these are mid-ship staterooms, you'll have easy access to everything on board. Norwegian StarDeluxe Owner's Suite sleeps up to six guests and offers a world of comfort with a living room, dining room, bedroom with king-size bed and some offer a separate children's bedroom. Guests will have an unforgettable experience in this suite with a convertible sofa, luxury bath with whirlpool tub and a wall of windows to enjoy the great view. Includes butler and concierge service. Norwegian StarVillas can accommodate up to seven guests. With three bedrooms, each with a king- or queen-size bed and luxury bath and shower, you have plenty of space to revel in. Also includes a living room, dining room as well as a private garden with hot tub, outdoor dining area and terrace to enjoy the beautiful view from. Includes butler and concierge service.